Espresso vs. Drip Coffee; Which has the most caffeine? I think the most shocking and refreshing element is simple: liberty of space. And with this unique element in mind, I think the designers were wise not to abuse such a rarity in Los Angeles. The shop was scarce but warm, there were basic tones but a close attention to detail. There was an elegance to how your pastry and coffee were served and even to how it was made. The espresso machine, built beneath the counter, resulted in all purging and tinkering kept to a minimum and the usual boisterous process seemed seemless. All focus was on the coffee, specifically on the origin of coffee. And each day the origin switched out; Tuesday- Ethiopia, Wednesday - Guatemala, Thursday - Costa Rica. Now that's my kind of work week. 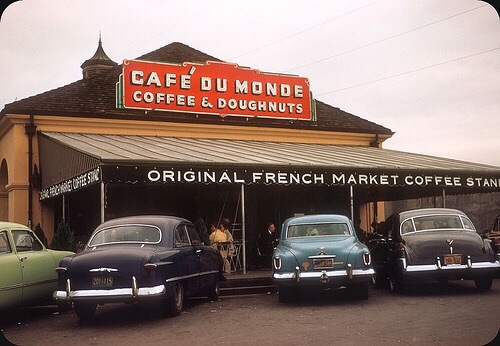 Two hundred years before Seattle or Portland were dubbed the coffee hubs of the nation, New Orleans served as America's gateway to coffee. Metaphorically and physically a gateway - or more specifically, a port. The Port of New Orleans was second to New York in destination for Latin American coffee producers in the 19th century. But we can go even further back to find New Orleans history in one single cup of chicory cafe au lait. Coffee first came to the European markets around the 17th century. Soon the dark, rich beverage hit major cities and centers of global trade. It wasn't until the 18th century that chicory, the root of a blue-flowered perennial plant, got in the coffee mix. Meanwhile across the pond, America was still part-taking in a heavy tea-culture. It wasn't until the British placed taxes on tea that people began taking a preference to coffee. (Tea - 0, Coffee - 1). As the demand for coffee grew, the French had established coffee plantations in Latin American countries. In 1718 the French found the city of New Orleans along the Mississippi and solidified trade access to the nation. Born was the coffee addiction. So much so, that when the American Civil War resulted in the Union naval implementing blockades, cutting off the port of New Orleans, the people needed a substitute. Enter Chicory. It acted more has a placeholder in the mix to make the coffee product last longer. Although it was without the caffeine, it had a similar taste to coffee and it was cheaper. Chicory would also find its purpose in warfare shortages and economic hardships like the Great Depression. And so when you really take a sip of chicory cafe au lait, you are drinking in the city's history. From wartimes to Katrina, life has certainly never been easy for the Big Easy. But much like the coffee, the people are bold, rooted deep in their culture and vibrant in their character. This weekend I am in New Orleans and I am going to do my best to captivate the world of Nola through the lens of coffee. It is said that the American colloquial morning coffee break was born along those coffee shops at the mouth of the Mississippi.